Places with fascinating beaches or huge skyscrapers are very famous for holidays. Give yourself a chance to try something different this year and explore one of the best mountain villages in the world. The mountains are the perfect haven for connecting with nature while marveling at beautiful landscapes and we’ve made a list of the most beautiful villages in Europe, the USA and Canada to check out! Some mountain villages in this world are particularly a must-visit, especially during winters, when one can see lantern-lit cobblestone street and warm cabins. Not only can you enjoy the beautiful scenery but you can also have a breath of fresh air and a friendly welcome from the people. Here are ten of the best mountain villages for staycations that are worth using hashtags for Instagram. Lake Tahoe, California is home to some of the most breathtaking views in the world. It’s a place that invites visitors all year round and offers a variety of outdoor adventure for just about anyone. Even if you’re just into driving around for pretty vistas. Whether it is during summer or winter holidays, Canazei is a perfect escapade from a busy routine. Visitors can enjoy endless hiking trails while taking time to appreciate the view of valleys and mountains. There are also challenging climbing practice areas for capable mountaineers. The place is famous for its ski center and modern ski lifts. Crans-Montana has much to offer to tourists who are looking for a great mountain view. It also offers a state-of-the-art alpine shopping and distinguished cultural and congress center. This small town is also the home to a national chocolate champion, so do not miss your chance of eating some chocolates that are wonderfully made by hand. This alpine town is hands down one of the most beautiful villages in Europe! Hallstatt, Austria is another great place to be. Hallstatt is situated between the edge of Hallstatter See and the takkDachstein mountains. Visitors describe it as “fairy tale” since it looks magical in the Salzkammergut Lake Region. Try walking from the market square and taking a picture of the many picture-perfect places you come across. Locals recommend having a nature walk through the Echerntal path. Fernie is a great choice for tourists who are into relaxation, exploration and, adventure. It is popular for its ski resorts and mountains for the whole family to enjoy. You can try skiing or cat-skiing, where you can ride on a heated snow-grooming vehicle to discover the untracked area. A small community to the Ordesa National Park, Torla provides a variety of picture-perfect sceneries to see and activities to do. Visitors should discover the high mountainous trails of the Pyrenees through hill walking, mountaineering, or skiing. Or you can enjoy the waterfalls through canyoneering or rafting. In the evening, spend a relaxing time with home-cooked delicacies and wine from the locals. If you want to take a break from the buzz of the city, then Megeve can offer a serene destination. It is in the south-east of France and is well-known for ski destinations. Megeve is a good location for winter sports. Spend some time sitting in the shadows of Mont Blanc or plunging into their luxurious spas. This town is quiet and is excellent for relieving stress. Cavalese is a popular holiday resort with a variety of ski resorts. Visitors can explore the mountains by walking, hiking, biking, or horseback riding. It is acknowledged by UNESCO as one of the most beautiful villages in Europe (and the planet!) because of its fauna and flora. Cavalese is a splendid mountain village you should explore. 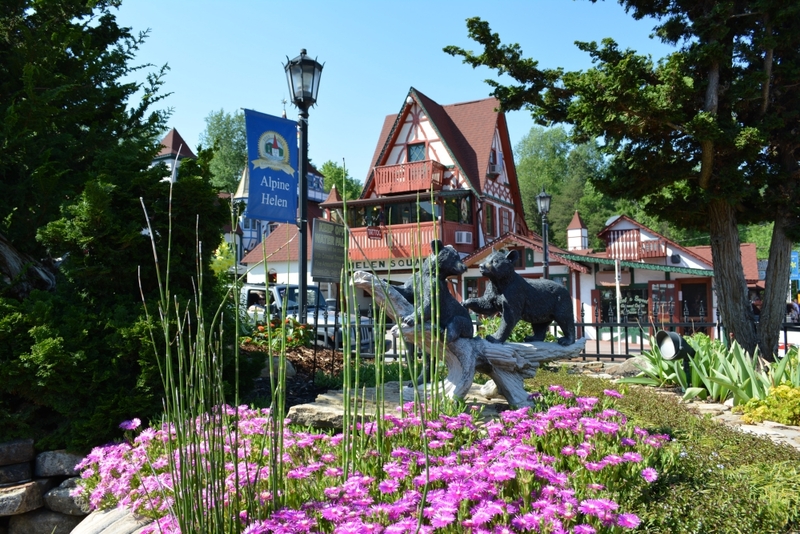 Hidden in the mountains of Northern Georgia is an Alpine Village called, Helen. A trip here will make you feel like you took a transatlantic flight to Germany, Austria or Switzerland. It’s got all the German food, sweets and flare you could want. And it’s surrounded by the mountains so waterfall hikes and vistas are minutes away. Camp nearby or stay in town! Flam, Norway is one of the most incredible little Fjordside villages I have ever seen in my life. The backdrop of the towering mountains to the miniature houses and villages along the fjord is captivating. You can take a three-hour cruise to this tiny village and feel like you are in the farthest corner of the earth while still having shoppes and eateries within walking distance. Visiting the mountains is one the best activities that can be done any time of the year. Exploring the best mountain villages is definitely perfect for all nature and adventure lovers. Fill your Instagram posts with snapshots of the famous mountain landmarks while giving your mind the relaxing break it deserves.